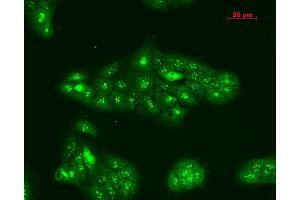 Immunocytochemistry/Immunofluorescence analysis using Rabbit Anti-TNF-R1 Polyclonal Antibody . Tissue: HeLa Cells. Species: Human. Fixation: 2% Formaldehyde for 20 min at RT. Primary Antibody: Rabbit Anti-TNF-R1 Polyclonal Antibody at 1:100 for 12 hours at 4°C. 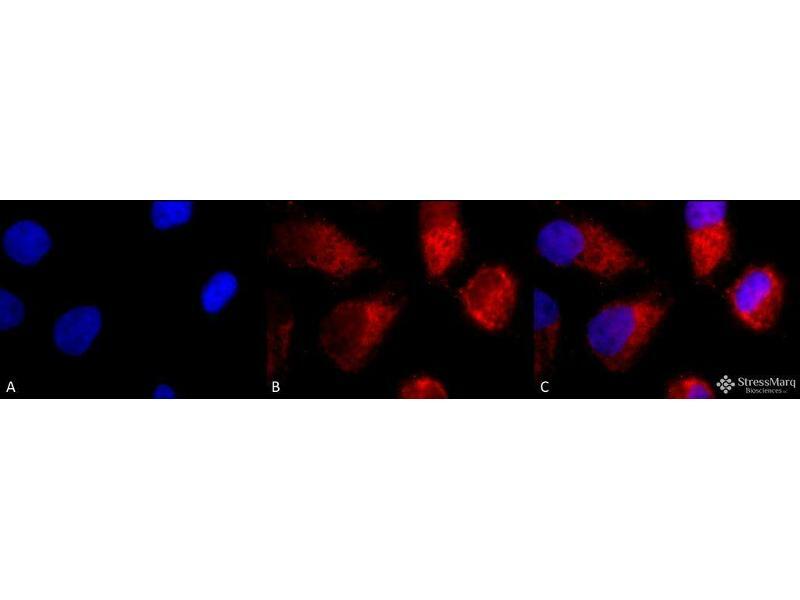 Secondary Antibody: APC Goat Anti-Rabbit (red) at 1:200 for 2 hours at RT. Counterstain: DAPI (blue) nuclear stain at 1:40000 for 2 hours at RT. Localization: Golgi apparatus membrane. Magnification: 100x. (A) DAPI (blue) nuclear stain. 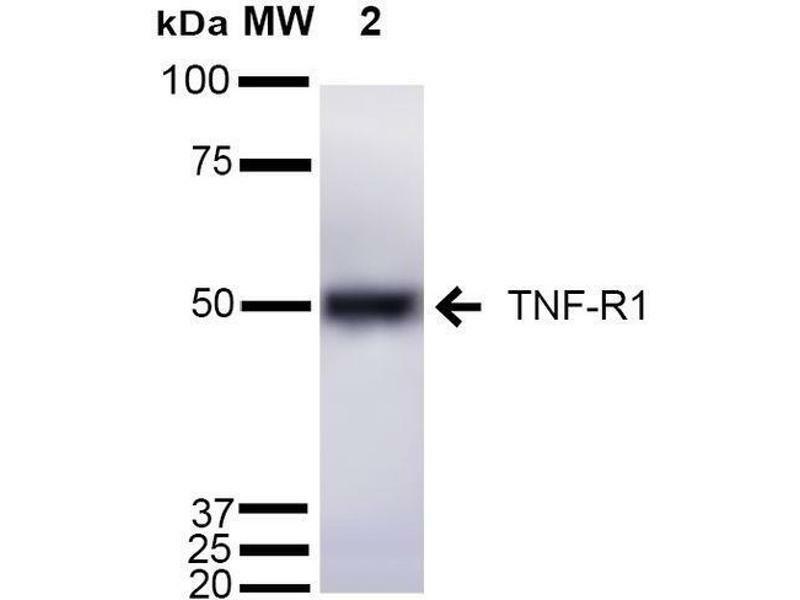 (B) Anti-TNF-R1 Antibody. (C) Composite. Immunohistochemistry analysis using Rabbit Anti-TNF-R1 Polyclonal Antibody . Tissue: backskin. Species: Mouse. Fixation: Bouin's Fixative Solution. Primary Antibody: Rabbit Anti-TNF-R1 Polyclonal Antibody at 1:100 for 1 hour at RT. 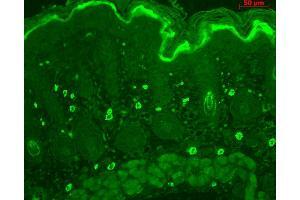 Secondary Antibody: FITC Goat Anti-Rabbit (green) at 1:50 for 1 hour at RT. Localization: dermis. Western blot analysis of Mouse Liver cell lysates showing detection of ~55 kDa TNF-R1 protein using Rabbit Anti-TNF-R1 Polyclonal Antibody . Lane 1: Molecular Weight Ladder (MW). Lane 2: Mouse Liver cell lysates. Load: 15 µg. Block: 5% Skim Milk in 1X TBST. Primary Antibody: Rabbit Anti-TNF-R1 Polyclonal Antibody at 1:1000 for 2 hours at RT. Secondary Antibody: Goat Anti-Rabbit IgG: HRP at 1:2000 for 60 min at RT. Color Development: ECL solution for 5 min at RT. Predicted/Observed Size: ~55 kDa. 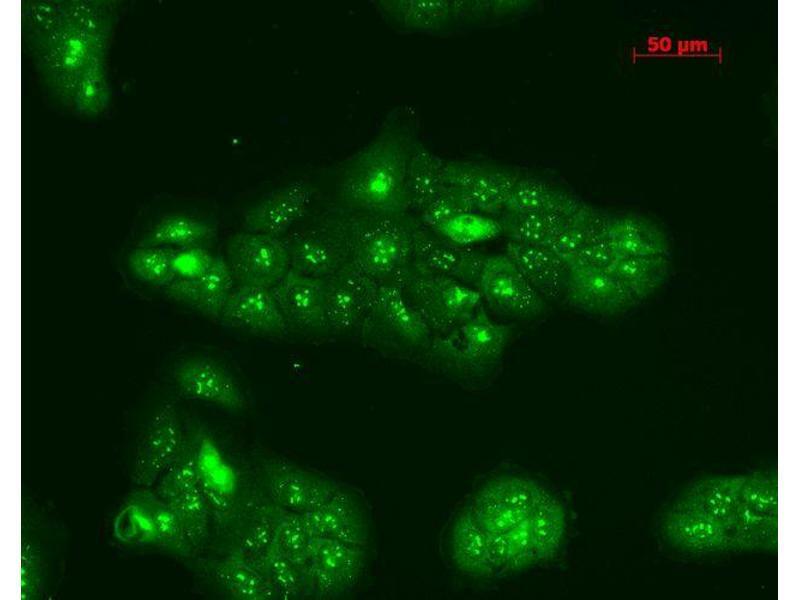 Immunocytochemistry/Immunofluorescence analysis using Rabbit Anti-TNF-R1 Polyclonal Antibody . Tissue: HaCaT cells. Species: Human. Fixation: Cold 100% methanol at -20C for 10 minutes. Primary Antibody: Rabbit Anti-TNF-R1 Polyclonal Antibody at 1:100 for 12 hours at 4°C. Secondary Antibody: FITC Goat Anti-Rabbit at 1:50 for 1-2 hours at RT in dark. Localization: Punctate nuclear staining, dotty staining in cytoplasm. 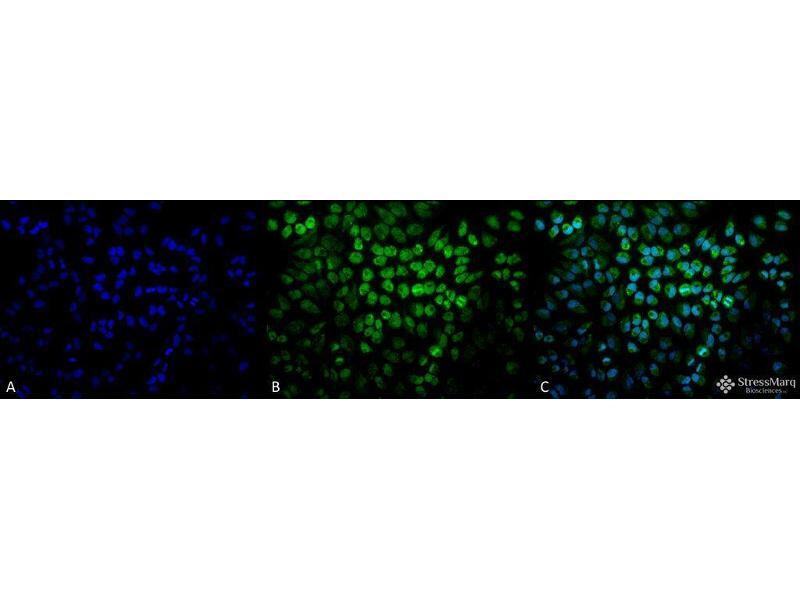 Immunocytochemistry/Immunofluorescence analysis using Rabbit Anti-TNF-R1 Polyclonal Antibody . Tissue: HeLa Cells. Species: Human. Fixation: 2% Formaldehyde for 20 min at RT. 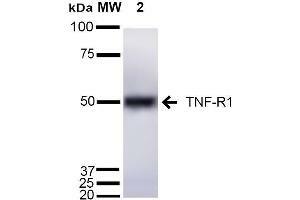 Primary Antibody: Rabbit Anti-TNF-R1 Polyclonal Antibody at 1:100 for 12 hours at 4°C. 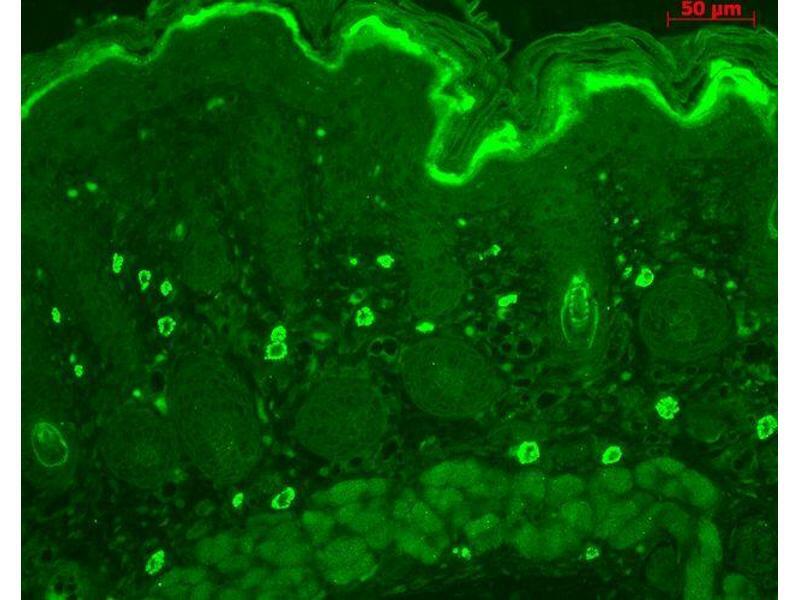 Secondary Antibody: FITC Goat Anti-Rabbit (green) at 1:200 for 2 hours at RT. Counterstain: DAPI (blue) nuclear stain at 1:40000 for 2 hours at RT. Localization: Golgi apparatus membrane. Magnification: 20x. (A) DAPI (blue) nuclear stain. 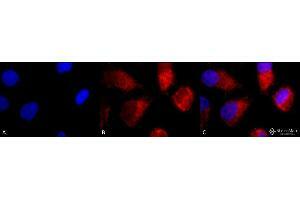 (B) Anti-TNF-R1 Antibody. (C) Composite. Background The Tumor Necrosis Factor Receptor (TNFR) also known as Cluster of differentiation (CD120) is a protein that belongs to the (TNF)/ (TNFR) superfamily. TNF interacts with two distinct receptors TNFR1 and TNFR2. These receptors share no homology on their cytoplasmic sequences(1,3).TNFR1 also known as p55/p60 is a high affinity receptor for TNF-α. The TNFR1 has an extracellular domain with variable numbers of cysteine-rich repeats. The functional properties of TNFR1 are targets in new therapies for osteoporosis, chronic inflammatory and autoimmune diseases (1, 2). The TNF-α/TNFR1 receptor complex is responsible for the recruitment and the subsequent activation of the caspase (aspartate-specific cysteine proteases) that regulate apoptosis. 1 μg/ml of SPC-170 was sufficient for detection of TNFR1 in 20 μg of Hela lysate by colorimetric immunoblot analysis using Goat anti-rabbit IgG:HRP as the secondary antibody.